Matt Palfrey is a strength and conditioning coach, health and ﬁtness consultant and the founder of the Sandbag Fitness blog - attracting garage-gym trainees from the world over. He believes that training should be simple but effective, and that a no-nonsense approach works best every time. Matt also shares his training philosophy in books such as The Complete Guide To Sandbag Training and Sandbag Training For MMA & Combat Sports - both highly recommended. You'll also find him on Facebook, Twitter, Pinterest, Youtube and Google+. And, of course, in Gymchat 206 - Sandbag Training and Gym Chat 218 - Alternative Approaches to Exercise Prescription. Great conversations. Get the most out of this amazing tool. 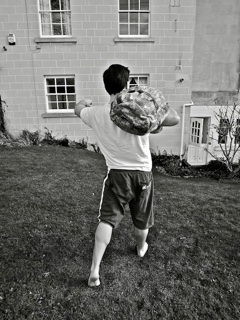 Although you can use a sandbag as an alternative to most free weights, there are certain exercises and activities that itʼs better suited to. And to get the very best from this training tool youʼre going to want to make sure you choose the most effective approach. Below youʼll ﬁnd 2 of the most successful ways to utilise sandbag training as part of your overall strength and conditioning program.